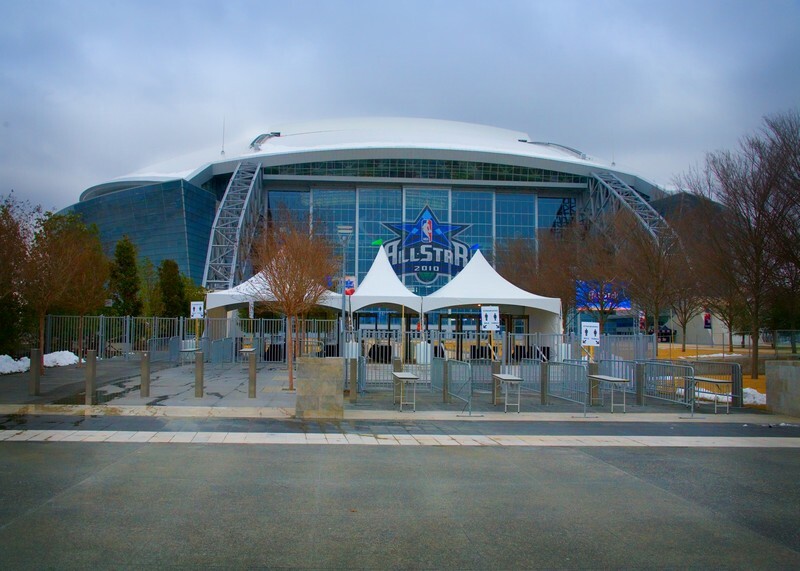 It all started about 2 months prior to the 2010 NBA All-Star Game when Rental Stop was approached by the National Basketball Association (NBA) regarding tent rentals for the big game at the new Dallas Cowboy Stadium. The tents were needed to cover the security gates at all the entrances to the stadium. 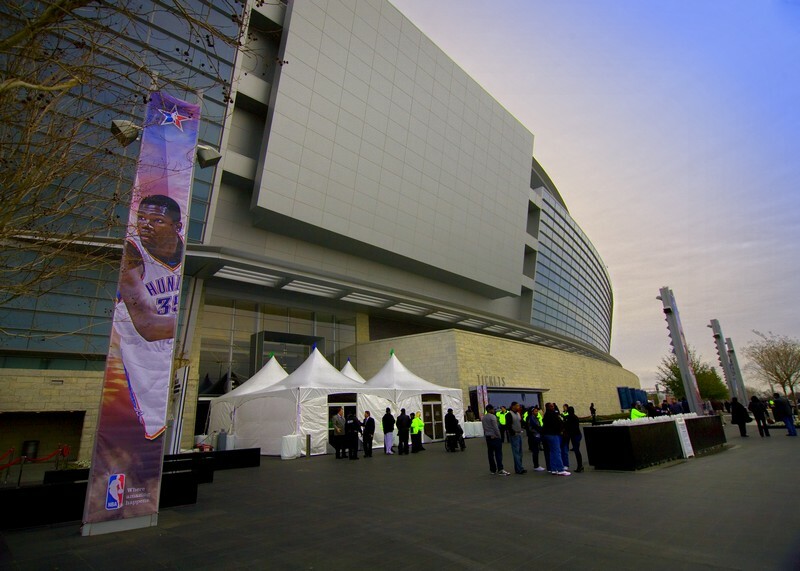 We were honored that the NBA had chosen to use our Services and Tents for the largest crowd in All-Star Game history. The install earlier in the week went well. It looked like another perfect and smooth Rental Stop Event was going to happen on Sunday. However, we had one unforeseen complication; Mother Nature had different plans for all. The forecast was calling for snow or some type of freezing precipitation late in the week but the real question is how much and where in the Dallas-Fort Worth Metroplex. While we were anticipating the weather we were also getting ready for the arrival of some close business friends from the North East Coast. They operate an event and party rental store and were coming back from the American Rental Association (ARA) Convention that was held in Orlando, Florida. The reasoning for them to show up in DFW was that a Blizzard was hitting the east coast and their flight was cancelled so they decided to visit us for a few days. They thought they were getting away from the white stuff by coming to DFW. They were in for a rude awakening. That very next morning after their arrival we all awoke to a white blanket of snow. By 8 am the Dallas Fort Worth area had a total of 4” snow and it was still coming down quite heavily. 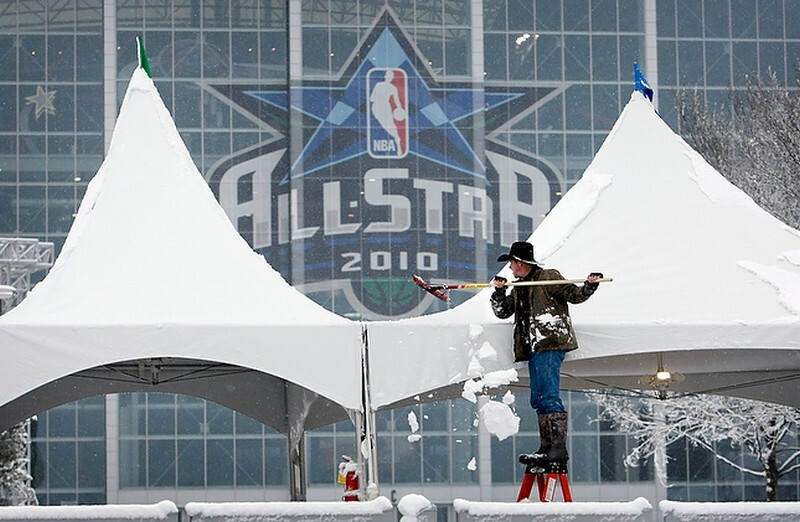 Normally, light snowfalls do not affect tents; unfortunately the tents that were erected per the NBA requirements did not have sidewalls on them. With no sidewalls installed on the tents prohibited us to use tent heaters that would help eliminate accumulation of heavy wet snow on top of the canopy top. Accumulation of snow on top of the tents could possibly cause the tents to collapse thus creating issues that are not needed right before this huge event. Plus we wanted to show the entire Dallas Cowboy Organization including Jerry Jones we were able to handle an unusual situation. With that said, we were blessed however to have good fellow tent friends in town that knew how to work in the snow a nd to deal with the tents. After 24 long hours, a total of 12” of snow and a lot of hard work, the snow stopped, the skies cleared, the tents were still standing, and the crowds started to come for the big event. We thank God for this “Miracle on Stadium Street” he showed us this past February. He tested us and gave us just enough to handle and we thank Him each and every day. We thank all who were involved on and off the site as well as those who prayed for the safety and the positive outcome that was achieved. This Event was truly a Team effort for all involved. Thank you LORD.